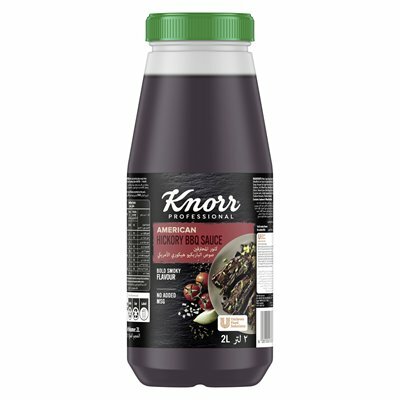 Knorr Hickory BBQ Sauce is made from a unique blend of tomato paste and spices for that special smoky aroma and taste. It is the ideal pour-over sauce for popular grilled dishes, such as BBQ chicken and grilled salmon. It can be used as a marinade, or dipping sauce for fried food. Soybean and Wheat Flour (Gluten). 12 Months Unopened. Open shelf life 1 month maximum under refrigerated condition (0-4°C) without cross-contamination. Ambient (Store in a cool and dry place protected from direct sunlight), Max 30°C. Knorr Hickory BBQ has that just-off-the-grill flavour. Try using it for basting while grilling, even if you use the oven.